Week 7 Late Games and Monday: It's a Trap! This is like playing a poker hand blind. Don’t play your cards, play the players. So last week we had almost half the lines over 10 points. This week, no lines over 6. Did the matchups suddenly improve? This game would suggest no, the matchups are still one-sided. The books made so much money last week that they didn’t even care that the Broncos got pasted by the Giants. I heard one statement to the effect that winning that game would have made the week embarrassingly good. Time for an insideh2o PSA: This 5.5 point line is still too high! Vegas knows that if they catch you more than a few times looking like an idiot by giving too many points, you may reconsider your betting style. So they make it look like 5.5 this week instead of 10+. 5.5 is dead and virtually no different than 3.5. The books want you to give as many points as possible in a year where the home dogs are 20-11. Don’t be fooled. See above. Don’t even look at the game. This line has moved to 4. Recall that anything from 3.5-5.5 is effectively the same. Even 4 is too much for a Seattle team that is only now starting to move the football on offense. We’re not convinced. The Giants aren’t a playoff team, but they’re not 1-6 bad. Biggest storyline of this game? 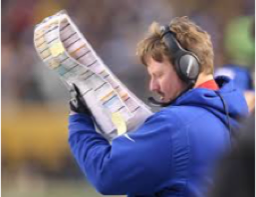 Ben McAdoo is not calling the plays anymore. He’s a young head coach and we think it’s admirable for him to try to do everything, but we hope he’s learning that some of the best respected coaches in the game are best known for (1) clapping, (2) going to Princeton, and (3) mismanaging the game clock and challenges. Advice to Ben: It’s a low bar to be keep a job as a head coach. Get rid of that ridiculous playsheet so you have both hands free, get clapping, and burn some timeouts at 2:05 in a close game. If you have any questions this week, just look across the sideline and do what Coach Pete does. Atta boy, Ben! Coach Pete knew you had it in you! Take a hug! BONUS PICK (paired with DAL/SF and PIT/CIN): Seattle win by 4-6 points, +600. So this is an interesting change-up. 5.5 point game, but different than the other two because it’s the home team as favorite. Normally we’d be saying that the Steelers may not be as good as expected, and that the Bengals look resurgent since they changed their OC, and their defense is really hard to score points on. But holy crap, the Steelers own the Bengals. Since 2010, they’re 12-3. And the games haven’t been really close. So it’s an interesting line, and going with our theme that the books are trolling the bettors…. We’re taking the points. BONUS PICK: Pittsburgh win by 4-6 points, +600 (paired with NYG/SEA and DAL/SF): One of these three will come in and you’re +200. Plus, you’re welcome. So here’s the thing. The Chargers are on a roll. But they’re 0-3 at “home”. Denver is 3-2, but they’ve only played one game on the road. And they lost it. Good thing for them this one counts as a home game. Denver has a ton to prove after getting spanked by the Giants, but they’re playing the only team that’s close to the Giants in terms of not meeting expectations. We’re big on expectations-based picks, and momentum. This is a terrible one-two for Denver, because the Chargers are on a roll. Two weeks ago this line is Denver -5.5 on the road. Chargers will win this one outright and it may not be close. If you’ve been following us on this logic, then the next step is clear ….. The Broncos are going to be massive underdogs next week in KC. (Coming off a loss, Andy Reid bye week genius, etc. etc. ), and they’re going to be a great value. Take your prop winnings from the games above and play the Broncos next week. This week the Chargers are going to continue to roll. If you’re a Pats fan, and you like to gamble, just admit it. You saw this line and secretly felt a little sick to your stomach. You know that the team is declining, you know that Vegas is taking advantage of the public by making Pats lines too high, you’re pinning your hopes on the new storyline that it takes time for the team to gel and that the first half of the regular season really doesn’t matter. We think you’ll get 3 weeks of coverage out of that one before it starts again. You know what I’m talking about …. That murmur across the internet …… “are the Pats even that good?” So when you bet against the Pats, and take the hook, and tell yourself that “if they win, I don’t mind paying the money”, we’re here to tell you that it’s OK to be secretly glad that you’re taking the points. Atlanta should be ashamed of themselves for losing to Miami. New England should be ashamed of themselves for squeaking by the Jets and the Bucs in recent weeks. Except for one thing: Atlanta is much better than New England. NFC East matchups can always be close. This is a strong division top to bottom, even with the 1-5 New York Giants, and 4.5 is too many points. There’s a theory in here that the lines overreact too quickly, and always looking for a team to anoint as a prohibitive favorite. It was the Chiefs. Now it’s the Eagles. The Eagles have been playing good football, and in a wide-open NFC they’ve got to be near the top. But this line is too high by 1.5 points. The teams are evenly matched. Much is being made about Josh Norman’s status, but we think he plays.